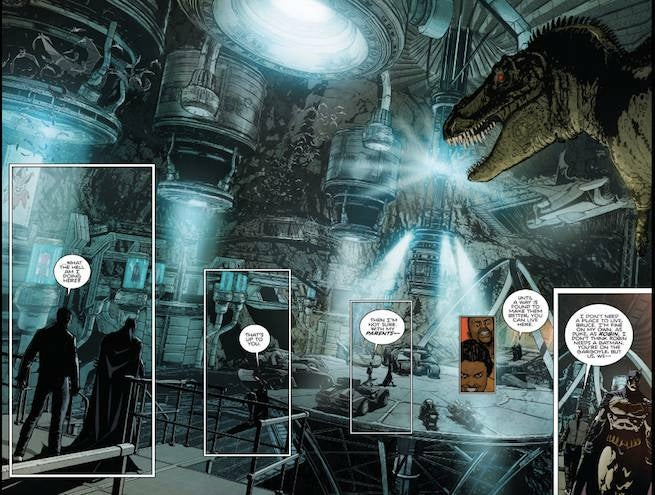 It's become a rite of passage for Batman artists to redesign the Batcave, Batmobile and other trappings of the Batman universe to suit their needs and strengths. It was big news when Greg Capullo did it -- more than once, actually, since he also got to do Zero Year redesigns for a lot of stuff -- and now that he's moved on, Mikel Janin is up to bat (no pun intended) next, with a beautiful double-paged spread incorporating elements of different Batcaves past. You can see familiar cars, the always-present T-rex, and more. There are railings, catwalks, and raised platforms that play to the same asethetic as Batman V Superman: Dawn of Justice, along with costumes hanging in tubes that don't serve as memorials -- as did Jason Todd's for so long -- but as an outfit in waiting for whoever wants to show up and fight alongside the Batman, apparently. We don't get too much time in the cave; there's a lot of ground to cover in a lot of different places in not a lot of page count in Batman: Rebirth #1, and so while we do get this gorgeous splash, it will be a bit before we get a real sense for the layout of the new Batcave. In any event, it's only two weeks until we have our next shot, with Batman #1 -- assuming it doesn't rear its high-tech head in Detective Comics #934, out next week from James Tynion IV, Eddie Barrows and Eber Ferreira. What else do these teams have in store for us? Well, this week we saw at least one member of the Bat-family change his costume...and it's probably not the one you're thinking of.